Neil Young's Fascination With 'Americana' Young's latest album with Crazy Horse, Americana, features songs many of us learned as children, like "Oh Susannah" and "Clementine." This interview was originally broadcast on June 6, 2012. 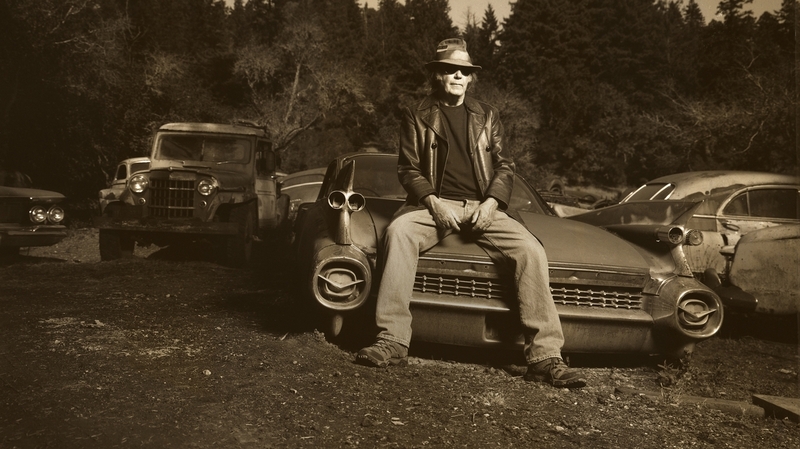 Neil Young and Crazy Horse's latest project — their first together in nine years — is an album featuring American folk songs and the tunes many of us learned as children, performed with grit, wit and a whole lot of electric guitar. Americana is a wild journey through the classic American songbook, featuring songs like "Oh, Susanna," "She'll Be Coming 'Round the Mountain" and "Clementine" reinterpreted in a folk-rock style. Young tells Fresh Air's Terry Gross that he got the idea for the album while working on a book about his life. Thinking about his childhood reminded him of visiting a nightclub in Ontario as a teenager; there he saw bands like The Company and The Thorns play sets. "The Thorns did 'Oh, Susannah' and they did [a new] arrangement of it, which I was knocked out by," he says. "They were pioneers at the beginning of the folk-rock era." Young copped The Thorns' arrangement of "Oh, Susannah" and The Company's version of "High Flying Bird" for his own band at the time, which was called The Squires. Both arrangements appear on Americana, which also features the original lyrics to songs such as "Clementine" and "This Land Is Your Land." "[When you were little], you didn't sing, 'Made me wonder / Is this land made for you and me?'" Young says. "Those were protest songs when they came out, and they were cleaned up and milked down ... and everybody got to sing them like they were happy little songs." Many of the songs Young features on the album are ones we all grew up singing in school. In several tracks, including his version of "God Save the Queen," a children's choir sings background tracks. "I had them on there because these songs are usually sung in classes, so it seemed logical to have the kids sing the Crazy Horse arrangements," Young says. "I woke up one morning a couple of months ago, and I was hearing 'God Save the Queen' in my head, and I thought, 'That's probably because when I was little, I went to school and sang 'God Save the Queen.' That's what happened.' So I kind of had this thing driven into my head, so it randomly came back, and I just happened to be recording Americana and I thought, 'I'll just do 'God Save the Queen' today and see how that works.'" "I heard that song back in 1964, and I was really into the groove and the melody and the fact that it was an old song with a new melody and old lyrics. And then, when I did it in 2012, I started relating more to the lyrics and started doing more research on the lyrics. I actually got into what the lyrics were really about more than I was in 1964. I chose a few verses that emphasized a certain darkness, but they were all the original verses. ... Because I felt that the music was like a studious type of thing, it was like, 'Well, we're looking at something here. This is kind of historic stuff.' And I'm using the folk process to change it, which is fair game — but I'm still keeping the message of the original songs." "The song says, 'When I sing about love and war / I don't really know what I'm saying.' And I think that sums it up. Because they're very deep subjects. You can't possibly know what it means to somebody else. War to one person may mean a justified thing that's happening for a very good reason, and another person may think that's a terrible thing and never should have happened. And another person will be thinking that he lost his sister or his brother or his mother in the war and it was a waste of time. And another person could be thinking the exact opposite: that his brother went to war and gave his life for our country. So you can't really have an opinion, although I have opinions and I've had them and I've made very loud statements about things. But that's the way I felt at the time. When I did the Living With War album, I was very outspoken about the anger I felt about certain things that were happening at that time in history. But again, I was no more right than the people who believed in it because it was such a big thing — how can you know? How can you know all of the reasons and everything that's happening? I just don't enjoy war. I'm not like a fan of war. And love can be very damaging, and it can be very good. So you just don't know where to go with these things. So I wrote about that — the quandary of not knowing what to do with any of those things. It's kind of a useless point of view."